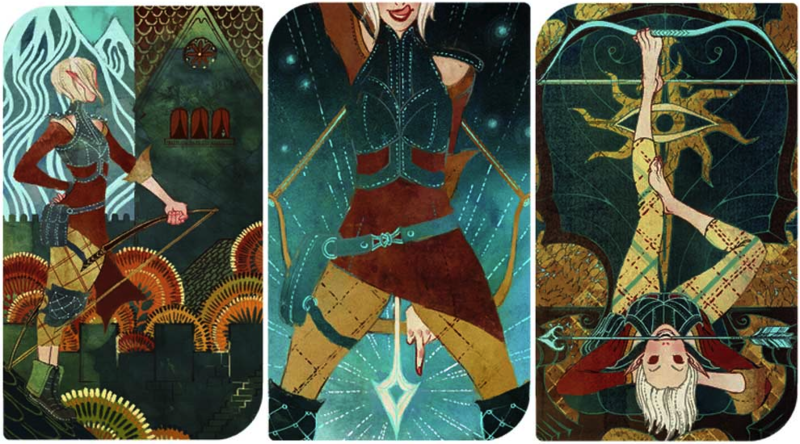 Dragon Age: Inquisition characters are represented in-game by tarot cards. How and why do these cards change? 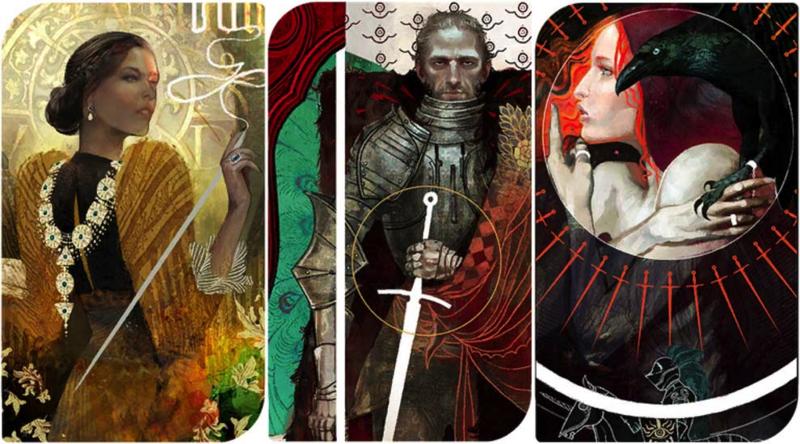 Some Dragon Age: Inquisition characters only have one character card, while others have as many as four. There are multiple factors that affect which card you see on the war table and the party select screen – romance, personal quests, and the ending of the game. The easiest way to explain is to break the cards down by character, so let’s tackle them now, starting with party members. There will be spoilers ahead, for both the game’s ending and various personal quests. 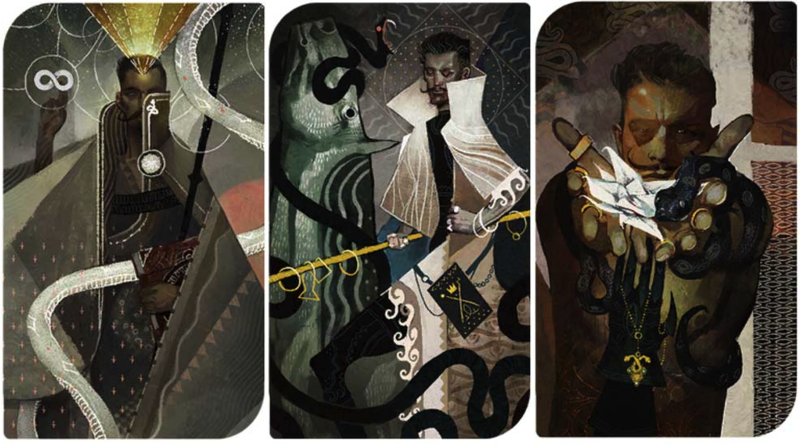 Blackwall is a romance option and a party member, so he has four possible character cards. Unlike some of the other party members, his personal quest is sort of mandatory – when you reach a certain stage of the game it will be triggered, and he’ll leave your party either temporarily or for good if you choose not to chase after him. While he’s away you’ll see the dark, sad character card. If you choose to bring him back and restore his faith in himself, you’ll get the bright, triumphant card. Finally, if you romance Blackwall you’ll see card representative of his devotion. 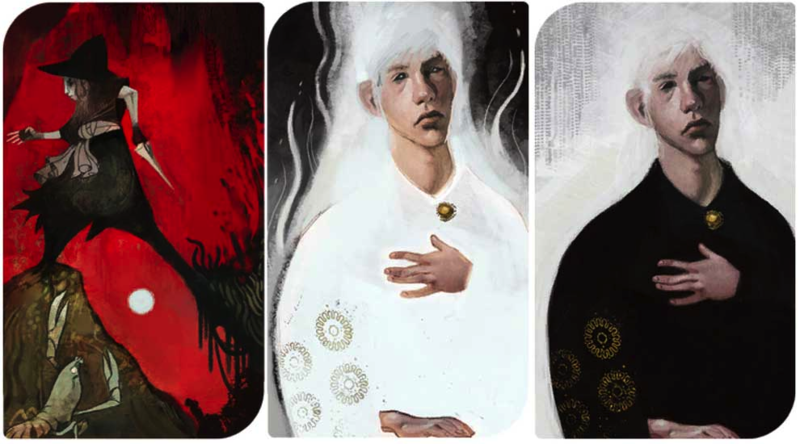 Cassandra is a mandatory party member who can play an important role in the epilogue, so she has the cards. If you romance her, you’ll receive the somewhat violent looking version fo the Temperance card, but otherwise, you’re stuck with her starter card until the main story is over. Then, if Cassandra is named Divine, you’ll see her in this role – although unless you urge her to stay with you, she’ll be absent and blacked out. Cole only has his starter card and then a card to indicate you have completed his personal quest – but there are two variations of this. If you suggest Cole embrace his spirit side, he’ll appear in white. If you support his acceptance of his human side, he’ll wear black, and appear more fleshy. 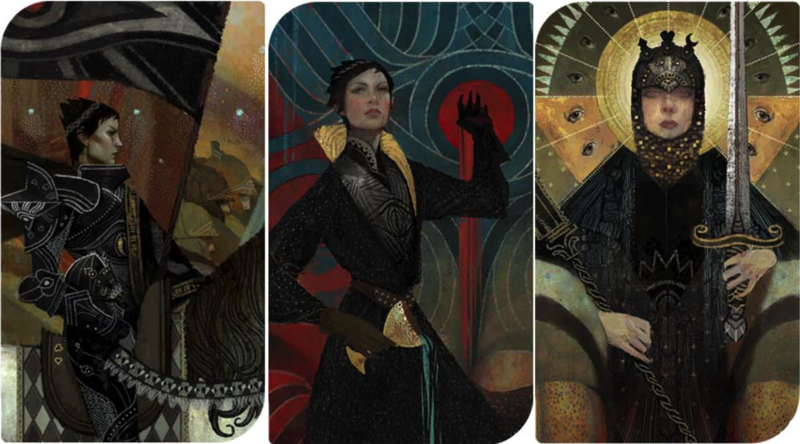 If you successfully complete Dorian’s personal quest his character card will change, becoming more colourful. If you romance him, he sports a very cool snake and flower combination, which you can read something into if you like. Iron Bull’s starting card is much more cheerful than either of those you’ll receive at the end of his personal quest. Bull’s personal quest contains one of those decision moments that present a real challenge, and neither card seems to suggest there’s a “right” answer. However, Bull’s romance card can replace this depressing sight with one indicative of the, ah ha ha ha, highly specialised relationship he’ll form with a willing Inquisitor. Sera is a lot of fun once you get to know her, and her cards reflect that. Make the effort to complete her quest and play pranks with her to be rewarded with a cheeky new card replacing her stand-offish original, and romance her for things to get really friendly. 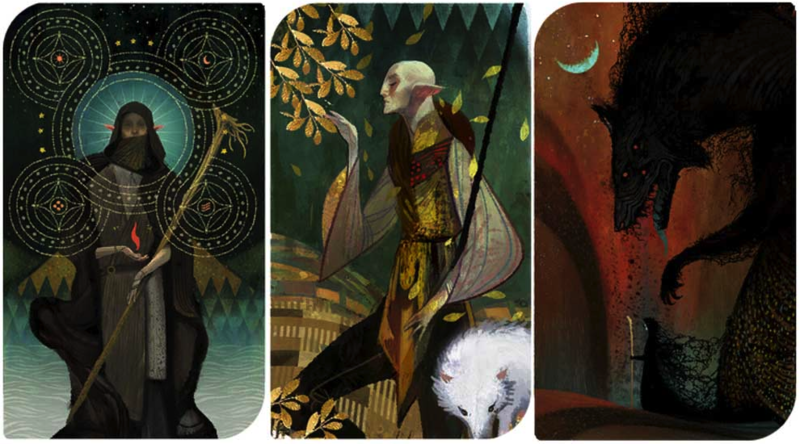 If you romance Solas you get to see a different side of the cautious, scholarly elf – you see him in his place in the natural and spiritual worlds. After the game ends you’ll also see another side of Solas. Roll on story DLC, amirite? You’ll want to complete Varric’s personal quest if you value his friendship, because the quest Here Lies the Abyss leaves him with a very depressing looking card. Pursuing his goals will restore a more cheerful aspect to the merchant prince. Neither of those are as good as the celebration of chest hair that is his original card, alas. 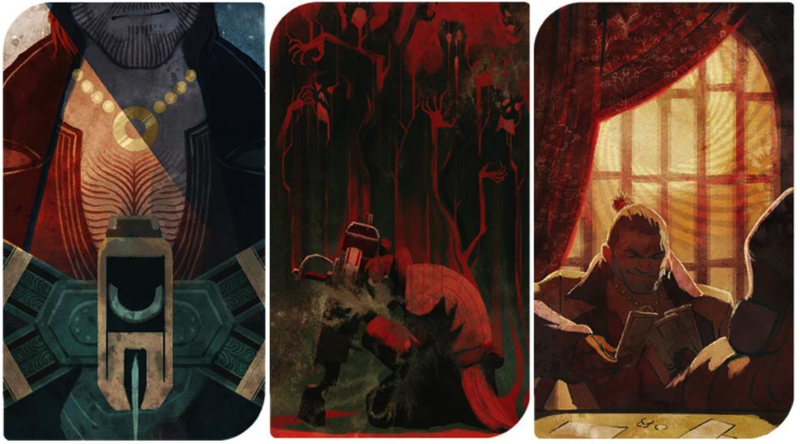 Vivienne has four cards, despite not being a romance option. If you pursue her personal quest, you have the opportunity to see one of two alternatives depending on your choices. Give Vivienne the real wyvern heart if you don’t want to get on her bad side. The mage’s fourth card is only available if she becomes Divine – yes, it’s possible. The advisors only have one card each, which don’t change, even if Leliana becomes Divine or you romance Cullen or Josephine.